Item Number: 10-36-01 18519 Actual Weight: 9 lbs. Hands-free step-on container uses foot pedal operation for extra safety from potentially hazardous materials. 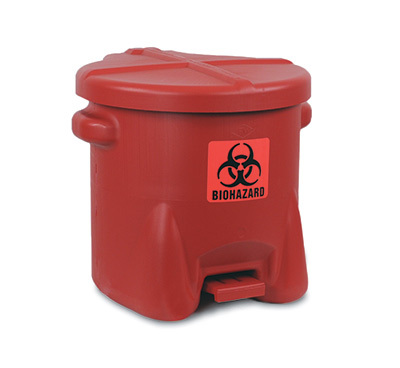 Red color and biohazard label alerts workers to the presence of harmful materials. Container has molded plastic side handles to make transporting easier. Container is fire safe and leakproof. Meets OSHA requirements for exposures to bloodborne pathogens. Complies to OSHA CFR1910.1030.